On behalf of the thousands of enthusiastic, industrious and engaged children who love coming to their Lubuto libraries, we thank you for the support that has made the rich libraries – with caring and dedicated staff – available to them in 2018, and generous donations toward continued operations in 2019. The Voices of Lubuto tell the story of what these libraries have come to mean to Zambia’s young people better than anyone; please enjoy this direct encounter with them and see the real impact of your support. … and, as you may have come to expect, much more! The 2-year PEPFAR DREAMS Innovation Grants have come to an end, but financial support from individuals like you allows us to sustain the life-changing programs established under our DREAMS grant. A smaller grant from ViiV Healthcare is supporting the cost of extending Lubuto’s DREAMS work with adolescent girls to the rural Nabukuyu community, as we also work with local businesses and organizations for sustaining support of the library. And we continue to seek grant aid for other initiatives. But Lubuto’s ongoing work – and the commitment the libraries make to be reliably present in the lives of tens of thousands of children – is dependent on continued assistance from generous individual donors. Lubuto’s accomplishments are your accomplishments! Please take a moment to read a few short stories about children whose lives have been improved in important ways by Lubuto, particularly through DREAMS programs: www.lubuto.org/stories. 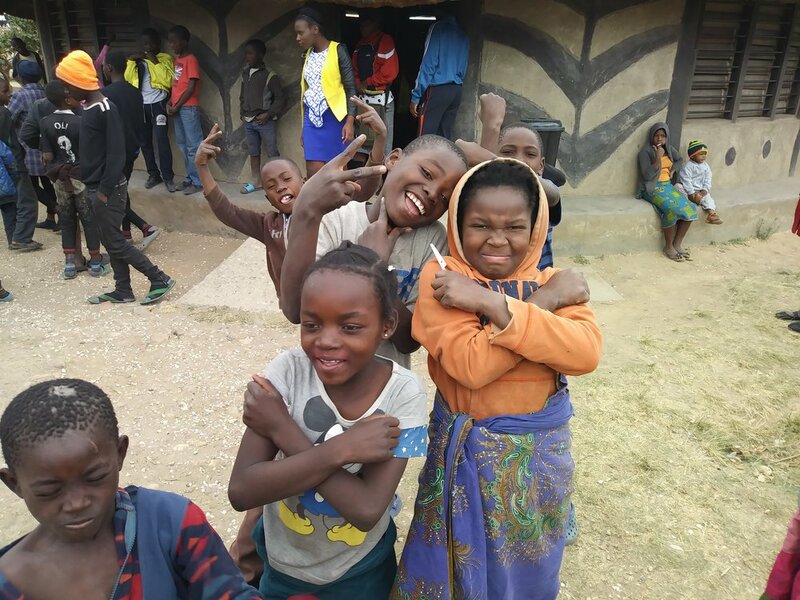 Although the DREAMS grant has ended, we know that the impact on young people’s lives will continue and grow, both through sustaining the established programs and through new initiatives to meet the needs of Zambia’s children. Who didn’t love Black Panther? Film showings have always been among Lubuto libraries’ most popular offerings. When Black Panther was released, it was obvious that it would be a smash hit with all ages. So when Jane Meyers brought Black Panther DVDs to Zambia last July, we were prepared for the instant and ongoing demand…especially as word got out on the schedule of showings at both the urban and rural Lubuto libraries. So many children flocked to the libraries for initial showings that we needed to assure them that they could see it again in coming days if they couldn’t squeeze in. And we have never stopped enjoying the sight of hundreds of boys and girls gleefully and proudly pouring out after each showing making the “Wakanda forever!” salute. Here are some of their reactions: www.lubuto.org/movietime-black-panther. Spoiler alert: if you haven’t seen Black Panther there are a few slight spoilers – but you should also go see the much-nominated film before the Academy Awards! But have you seen I Am Not a Witch? Equally as exciting for Lubuto moviegoers, however, is another award-nominated film, I Am Not a Witch, written and directed by Zambian filmmaker Rungano Nyoni. Shown at major film festivals around the world, Ms. Nyoni’s film about a young Zambian girl accused of witchcraft has garnered numerous awards—including the Best Feature Film at the Africa International Film Festival and the Best Directorial Debut at the Stockholm Film Festival. It was the UK’s entry for Best Foreign Language Film at the 2019 Academy Awards, and it currently holds a 97% on Rotten Tomatoes. We agree that this is a wonderful film and a remarkable international debut for a young, female Zambian filmmaker! But not only is I Am Not a Witch what Mark Kermode from The Observer called “comic, tragic—and captivatingly beautiful,” but it was also the film debut of two long-time LubutoDrama participants—19-year-old Mwengele Lwipa and 17-year-old Masa Zulu! We have many photos and film clips of their acting in Lubuto library plays over the years and were so excited to recognize them in this major international film. So were their friends who came to see them in showings of I Am Not a Witch at the library – or in frequent airings of the film on TV in Zambia. Here is what they had to say about one of their own reaching the big time in film: www.lubuto.org/movietime-i-am-not-a-witch. Mwengele and Masa, of course, were most excited. In addition to being paid for their work, the boys got to travel around Lusaka during the shooting and see themselves on the big screen. Both have been overwhelmed by the experience, and Mwengele said, “This is what I am meant to do!” Considering that they have already been invited to audition for more movies, it seems he may be right. Volunteer of the Month: Infamous! This month we thank the dedicated and joyous support for Lubuto's work by the eight members of the women's chorus, Infamous. For the past five years, these musical ladies have showcased Lubuto's work and gathered community together for an annual evening of Carols for Lubuto, hosted at the home of Board member and Infamous member Elena Michaels. Click here to learn more.